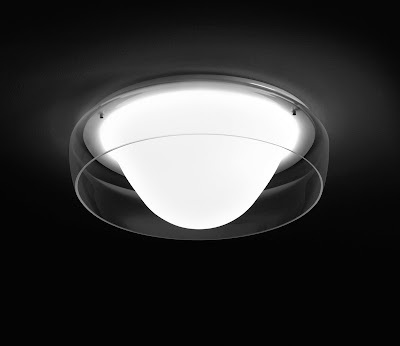 Glass Ceiling Light Fixture and Wall Lamp: Leucos Jelly Fish Lamp (image credit Stardust.com). Leucos Jelly Fish lamp is a ceiling light fixture and/or wall sconce made with a single piece of glass. The Jelly Fish lamp was named for the translucent shape of a Jellyfish. We love design inspired by nature. Although we are very picky when it comes to approving of new lighting fixtures, we are completely sold on this one. This lamp certainly got our attention with its beautiful gently rounded curves. A perfectly proportioned blown glass ceiling light fixture. This lamp is simply perfect and we will probably be getting one for our entrance hall way. This ceiling lamp really blends in with its environment. The Jelly Fish lamp can be used as a wall lamp or a ceiling lamp. 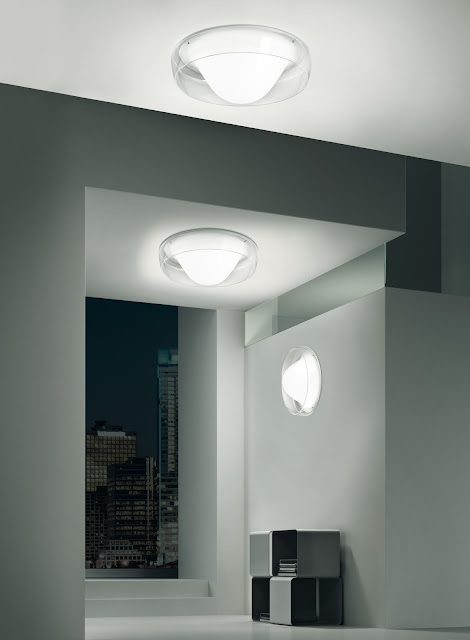 The Jelly Fish 40 lamp was designed by the Rockwell Group for Leucos in Italy.